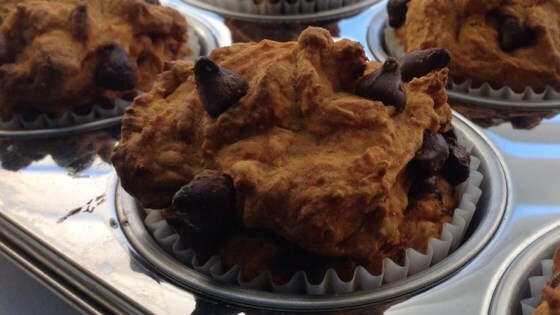 "Tasty vegan muffins that are low-fat. Much of the fat content in this recipe is from the chocolate chips, but they are soooo worth it!" Whisk whole wheat flour, brown sugar, baking powder, cinnamon, baking soda, salt, and nutmeg in a large bowl. Stir pumpkin and water into dry ingredients, mixing until just moistened; fold in chocolate chips. Spoon batter into prepared muffin cups, filling them to just below the tops. Bake in the preheated oven until lightly browned and tops of muffins bounce back when pressed lightly, 25 to 30 minutes. Let muffins cool in pans for 5 minutes until removing to a wire rack to cool completely.